This week I had the need to return one of my X-T2’s for a repair. It has been worked hard and for some reason had developed an intermittent fault where it would not turn on. 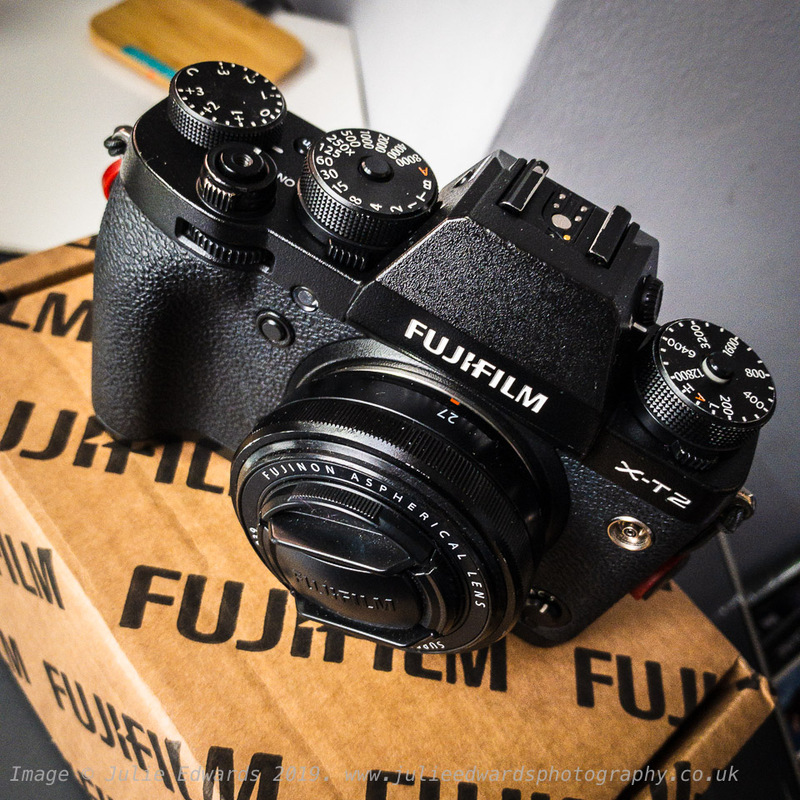 Luckily I qualify for FPS – FUJIFILM Professional Services. Logging on to the page ( https://fujifilm-connect.com/en/fps.php ) , I selected the camera from the list of my registered bodies, entered the fault and accepted the quote. After paying online the booking was confirmed. As the repair was not too urgent, I waited for the pre-paid packaging that Fuji send out (otherwise I could have sent in urgently myself). Fuji send a pre-paid Royal Mail Special delivery bag with custom box and packing for the item being returned which just needs dropping at the post office. 2 days later the camera was back in my hands having been delivered by courier back in the custom packaging. Nice and pristine it looked too, obviously having had a good clean as well as the main circuit replaced (according to the delivery note). I have read varying comments on the Fuji service but I have to say my experience was very positive once I understood how it worked. 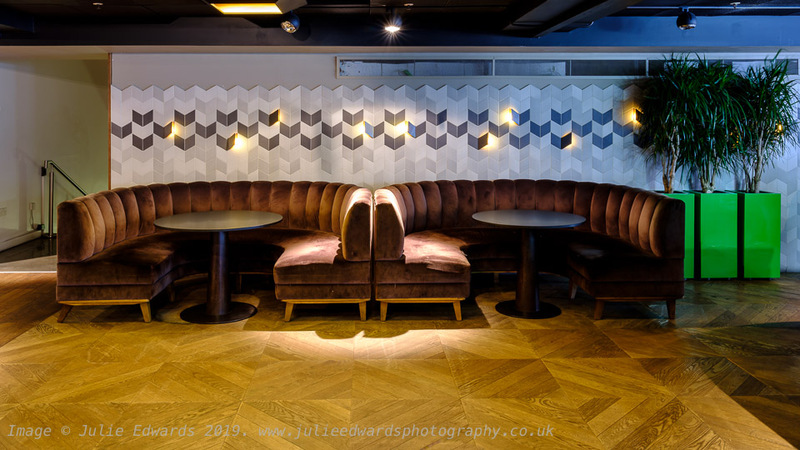 I mentioned in my last post that I had hired a GFX50S for a major interiors photoshoot (well, I’m not sure if I mentioned interiors). Given that I am mainly a press photographer, you might consider it a bit strange I am shooting interiors, the short line is, I actually started out many years ago shooting and teaching very technical architectural and historical building photography including producing rectified images that could be used for measuring features. 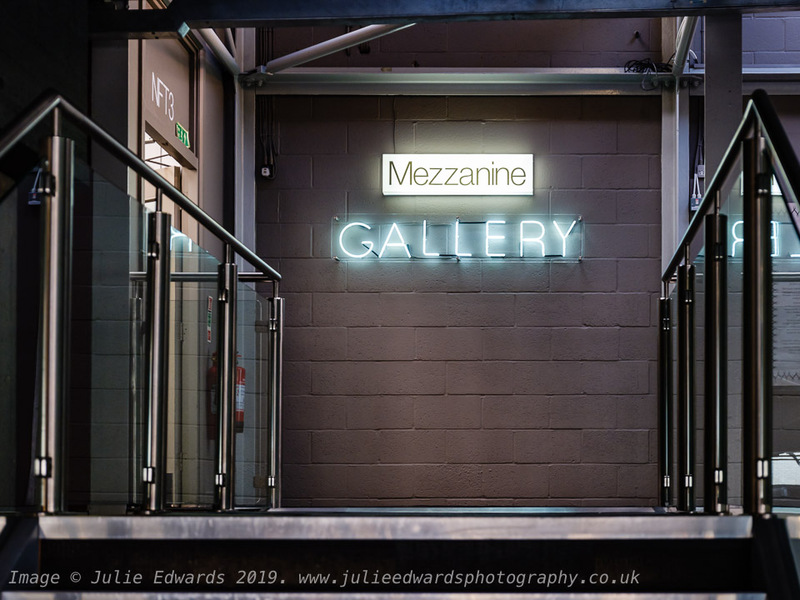 Back to the present day and I have reinstated building photography (well actually venue photography) to help grow my business (new website coming soon). 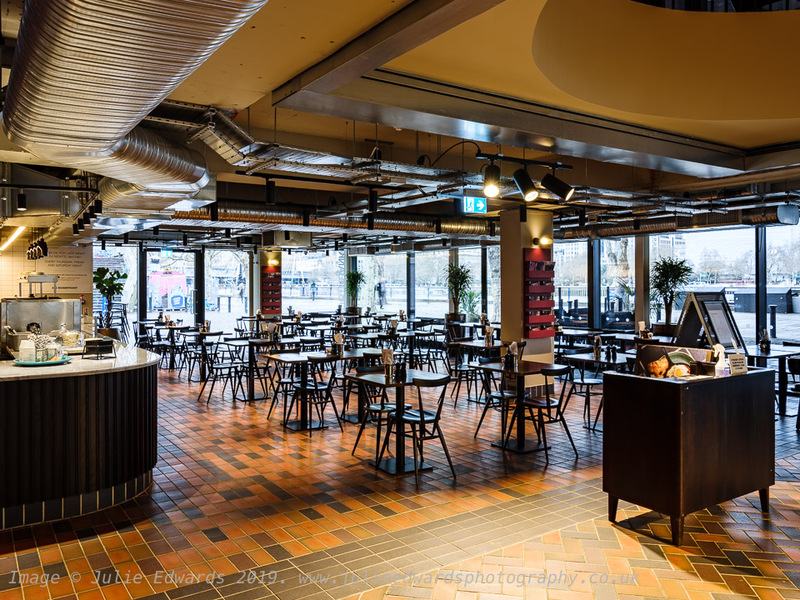 This led me to using the GFX50S with the 23mm and 32-64mm on a Tripod in the BFI Southbank in the second week of March. Working in mainly performance venues and cinemas, my typical subjects have very bright lights (stage lights and projectors) in very dark rooms (with typically black dark walls). This means a very high luminosity range in most scenes and therefore my go-to method in the past has always been a form of HDR, bracketing all shots and then choosing how I combine them to get the get, most realistic result back at the office. When I moved over the the X-Series cameras, shooting bracketed series became so much easier. On my old cameras I could set the bracket but I still had to press the shutter for every exposure i.e. Correct exposure, +1, +2, -1, -2 having to count each shutter press, every now and then I got out of sync and had to start again. With the X-Series (and now the GFX) this became so much easier, turn on the bracketing, switch to continuous and a single press fires the 5 shots. So much easier! I shot the BFI with a mixture of X-T2 and GFX. 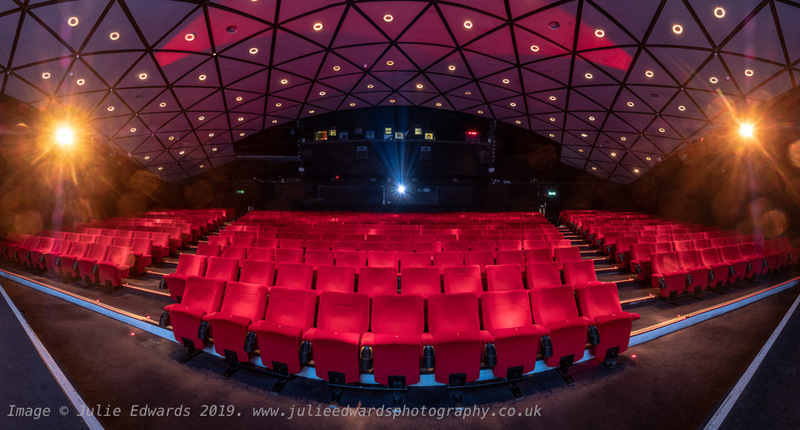 For the larger auditorium the X-T2 and 14mm was mounted on a correctly set nodal ninja to produce a wide panoramic image (interesting note – although Lightroom has introduced panoramic blending, ptGui still does a better job with more control in my opinion). I triggered both the GFX and X-T2 using a Pocket Wizard PlusIII with a cable plugged into the 2.5mm socket. One thing to note that although the pocket wizzard can trigger the Autofocus, it is far more reliable to manually focus each shot, making use of the focus peaking to check the DOF. (For panoramas I never refocus, I choose an appropriate aperture and use hyperfocal). So how is the GFX an improvement over the X-T’s for this work? If we ignore that the fact that the camera is producing bigger images there are 2 key points. 1. Detail. I know this has been covered to death but this camera really does capture all the detail and nuances of the scene in front of it. Even thought the delivered image might be no bigger than a file delivered from an X-T, the detail in even the downsized images still exceeds that rendered by it’s smaller cousins. 2. Dynamic Range. This to me is the real game changer. Scenes where I would still have typically used a second exposure just to add shadow detail, I could just lift the shadows on the GFX files. There really is so much more in the files as the comparison below shows. Riverfront Upstairs BFI Southbank GFX50S, 23MM, Single RAF vs HDR comparison. Whilst there are a number of DSLR’s now with around 50MP, offering a similar sized file, what the GFX50 offers with its larger sensor are less tightly packed pixels compared to standard full frame (simplifying it somewhat) . This very visibly leads to better quality pixels, resolving more detail and packing a greater range of light sensitivity, giving greater detail and smoother graduations in colour and light/shadow. Obviously there are downsides. Autofocus is not fast enough for my press or red carpet work (although I have ideas here). It is expensive (compared to the remainder of the X series, less so it comparing to the high end professional Full Frame Nikons & Canons like the D5 & 1DX). I am going to try the GFX50R next to see how it compares which at it’s lower price point, may be a more viable option (although no vertical grip may make this too much of a compromise). So the bottom line, what value will it add to my business? Would it just be improved image quality or are there other benefits? Would these improve my profitability? These are the difficult questions every professional photographer has to consider when new cameras and technology are released. At the price point, this camera in my mind is without comparison for photographing interiors and I will ensure I price all future work of this nature to enable me to hire this in. In such a technical genre of photography, this camera can feature as a sales point as well as production tool. The same is true for studio based portrait work where again, I will hire it in for the higher-end shoots. At the moment I cannot quite justify adding this system to my owned arsenal but should the pricing change with the introduction of the GFX100 (100MP version), this point of view might change. If you photograph buildings or landscapes, I highly recommend trying this camera if you have not already. Next week I have the first of a couple of large interiors architecture shoot. As I was planning the shoot I realised this would be the ideal test bed for the Fujifilm “medium format” GFX50S camera. Until this week my only experience with medium format is my vintage Rolliflex, so I have never shot with anything other than Full-Frame or APS-C on digital. With this in mind I arranged to hire a GFX with the 23mm and the 32-64mm for a good few days before the shoot. My plan was to carry it with me instead of a little X-T to get the feel of the camera. The first day I had it I needed to pop up to Gatwick Airport. Shot with the 23mm at F20, ISO800 (Not the ideal settings, I was rushing!!) , this JPG was shot in ACROS. I love the graduations in the greys, which given it is a JPG with it’s limited grey levels is quite an achievement. I was struggling to find the limits of focusing, reframing and at what speeds I could hand hold the camera. It’s not really that much bigger or heavier than the full frame Nikon’s I used for years but there is a whole different feel (especially where depth of field is concerned) . This is another ISO800 JPG. (Sorry for mixing colour and monochrome, a big no-no normally). I’m sure every photographer has a long suffering partner that is asked to pose of “just look up” again and again and again. This RAF was shot hand-held at 1/40th on the 32-64 at 64mm. At 3200ISO and F4, using the Classic Chrome profile in lightroom mobile I love not only the colours and the graduations from light to dark, but also the way the sharpness in the eyes transition to the milky soft out of focus areas. Its this transition in sharpness that give medium format its “almost 3D” quality. This final picture was shot this morning, at 1/3000, F9, ISO100. The RAF edited in lightroom mobile has had the Velvia Profile applied and a couple of selective edits. This is only a small version of the image, you will have to take my word on how much detail there is in the wave. So after a couple of days, what are my initial thoughts? It’s not as big and as heavy as I thought it would be, its not much worse than say a D800 with a decent lens on it. Of course it is slower than its smaller Fuji cousins but I kind of like that, it reminds me to slow down and this about the shot I’m taking, I cant take 2 or 3 frames at high speed so I have to concentrate on the moment. I was nicely surprised on how well Lightroom Mobile handled both the JPG and RAF files on my 2018 generation iPad Pro . Sure the previews took a while to build in the photos application import but copying over was fast, as was the ingesting into lightroom and editing. The only real niggle I have at the moment is a user interface issue. The GFX50S has most of the buttons (in similar places) that the X-T range have. Why then can I not assign the front dial to ISO like on the smaller cameras. I could argue with myself that “well fast use is not what it is designed for, you are probably not going to be following action with the GFX50S up to your eye needing quick adjustments”. This is true, on a tripod or in a studio the top-plate dial is fine but why limit it? It’s only software. Why are these things not more consistent?? I had avoided this camera since its release because I was worried that I would love its image quality, I was right to worry…. If you go back on my timeline you will no doubt find other posts from February’s past about the BAFTAs. It’s an event I have been covering for quite a few years now and this year took a similar flow to years gone by; travel up on the Saturday, check into the hotel, cover the Nominees Party on the Saturday night, edit late, arrive at the Albert Hall for 2pm, cover the Red Carpet from 4pm till 7pm and then the Winners press room before heading back to the hotel at about 10:30 to edit till the early hours the next morning. A few hours sleep then finish the edit the Monday morning. Just over 24 hours later, here he is with his award. The 50-140 enabled me to get the fashion full length and half length images, combining with a Godox AD200 + remote head to fill in the shadows and detail. These are the images the magazines need as the following weeks publications around the world will be full of articles discussing the stars, their fashion successes and failures. (That is until the oscars when it will start again with a new set of outfits and stars). Getting these images is a case of setting the camera at the start and then continual concentration, the light is changing through the afternoon (white balance), the subjects may or may not look at you or even pose in front of you. Whilst ensuring that I don’t miss the fashion shots I like to keep a careful eye out for the images I find more interesting to shoot: Tight portraits showing the emotion, the stars standing in the queue waiting to have their photos taken (every year a queue forms consisting of the technical people that no one ever sees (the unsung hero’s), standing next to the up-and-coming actors, standing next to some of the biggest stars in the movie world. I shoot the close-ups with the 100-400, sometimes triggering a remote AD200 flash, sometimes on available light. This means using an higher ISO of 2000+ with a slower than standard recommendation shutter speeds (in most cases about 1/200th – 1/250th with the lens at about 600mm equivalence). A steady hand and good the great stabilisation of the lens rule here. Over the course of the weekend I filed about 950 images, just under 20 were taken with the 56, about 170 with the 100-400 and the remainder with the 50-140. I’ll post a fuller set of colour images (more likely to be seen in publications) later in the week but at the moment I thought a quick post featuring these images and a description of the working methods would give a good taste. It’s Saturday morning and I am on the train to London. This weekend in the BAFTA’s and I will be covering the nominees party tonight before heading over to the Royal Albert Hall for the main event Sunday. It was with this in mind that at the end of Wednesday I headed over to Eastbourne and Hastings for 2 days “off the grid” (ok, I’ll be honest I looked at my emails twice because I have an important meeting Monday and I needed to confirm the time. I also answered one phone call yesterday about today’s job). I did not look at any social media, thats no Facebook, no Twitter, no LinkedIn, no blogging and no news. For someone who’s social media is a big part of their work, this is, to be honest, quite difficult but I did manage it. (This morning’s catch up was quite intense though!). I spent the Thursday exploring Hastings, a town I have only really passed through. My plan was to visit the Jerwood Gallery and the Old Town and then spend some time painting (how I relax – see @artyfartyedwards on instagram). To ensure I did not take a work attitude to the photography, I took an old X-T1 with a 27mm Pancake set to extreme Black and White (thats with a Yellow Filter film simulation and +2 on the lights and shadows). With Storm Erik in full force, the waves were stunning, I guess the shape and position of Hastings explains why the waves here were more impressive than my home town of Worthing. The aim of the photography was just to please me. I feel that we professional photographers often get so lost in the business of photography, the commercial aspects of the image, practicing techniques to use professionally that we often forget to take time and shot just to please ourselves. The fishing boats are a very common subject for photos in the town, its easy to see why, there are pictures every which way you look. Of course with so much fish around, you can expect gulls and here I did switch to the one other lens I brought with me, the 35/1.4. It’s been around for quite a while but it is a favourite of mine despite being slow to focus. The storm clouds of course do not only bring “poor weather” they can also be responsible for funnelling the light, particularly at either end of the day. I think these images show that chasing the latest technology, the latest gizmo is not the best way to get lovely emotional images. Taking time, settling into the location, taking it slow, not worrying about what is going on elsewhere and in fact focusing 100% on whats in front of you is far more important! I have a confession to make though. I spent a while on the beach photographing the waves. I could see what I was capturing and was loving it, in my head I was visualising how a set of these images could be printed and presented and for the first time ever, I had a yearning to be shooting on the medium format GFX (yes despite all I said above!). So as I walked back to the car in the afternoon light after a relaxing day looking at paintings and creating photos just because…. this little thought raised it’s head… “you really do need to try the GFX you know” … “nothing to do with business you understand.. just because“..
P.s. The thought did not last long… I spent the next day painting and not worrying about the business of photography. I quite often enjoy a wander along Worthing beach first thing on the morning, usually with a cup of tea in my hand (I do not live far back from the beach). However this morning that tea would have gone cold rather quick. Worthing quite often misses the snow when the country is hit, probably due to being shielded by the South Downs. However, this morning, last night’s snowfall remained and the beach still had a slight dusting. Having lived here for over 11 years now, I think this is only the 2nd or 3rd time I have seen the beach like this. The combination of having the white of the crashing waves vs the white of the snow I thought looked quite surreal. While snow and sea makes for nice landscapes, as a press photographer it’s the human aspect that is important, which means hanging around, watching and trying to show people dealing with the weather whilst at the same time trying to make a pretty picture. Finishing with a nice pretty image – where I placed the camera in the snow and used the adjustable rear live view to see what I was doing…. Always be on the look out for those different angles..
Fuji and Godox at an event. Once a month I can be found at the British Film Institute (BFI) working as the official photographer at film critic Mark Kermode’s live show. 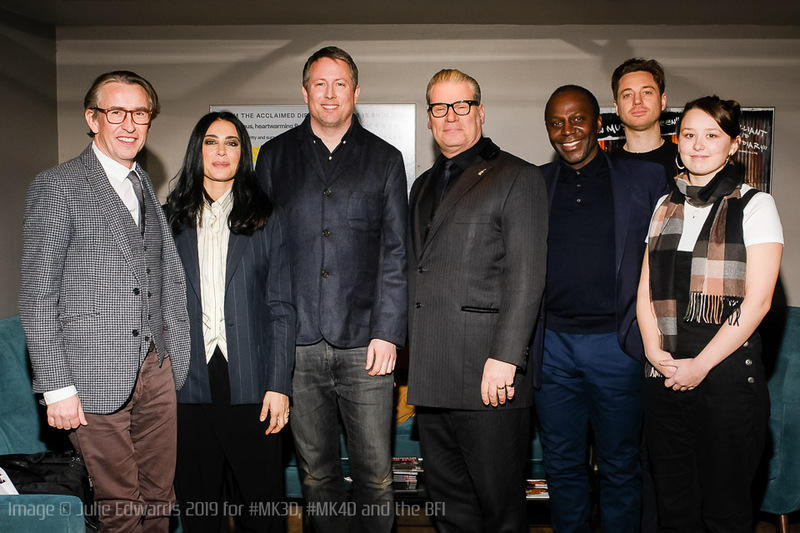 Steve Coogan, Nadine Labaki, Mark Kermode, Liv Hill, James Gardner and Cyril Nri backstage at Mark Kermode Live in 3D on Monday 28 January 2019 at BFI Southbank, London. The guests gather backstage before the show. Picture by Julie Edwards. This entails working backstage to get a nice group shot of Mark with all of the guests as well as joining everyone for a pre-show run though to make sure I know the order as well as the host and the guests. This way I can make sure that I am always positioned in the best possible position to get good images of both Mark and the guests which are suitable for both social media and press. For the group shot I use an X-T2 with the 16-55/F2.8 coupled with a Godox TTL wireless controller and an Ad200 handheld high above me near the ceiling. This way I can be sure to get (fairly) even lighting without flash fare or reflections in any spectacles. 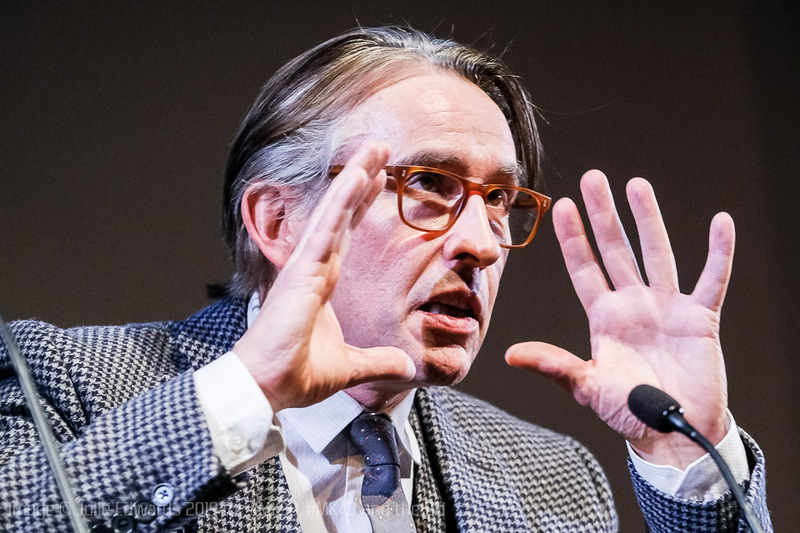 Steve Coogan on stage at Mark Kermode Live in 3D on Monday 28 January 2019 at BFI Southbank, London. Steve joined Mark to chat about his film Stan and Ollie which he is watching here. Picture by Julie Edwards. During the show I work with 2 X-T2’s, usually in Astia film simulation, preset to a fixed kelvin white balance, one with the 16-55, the other with the 50-140. 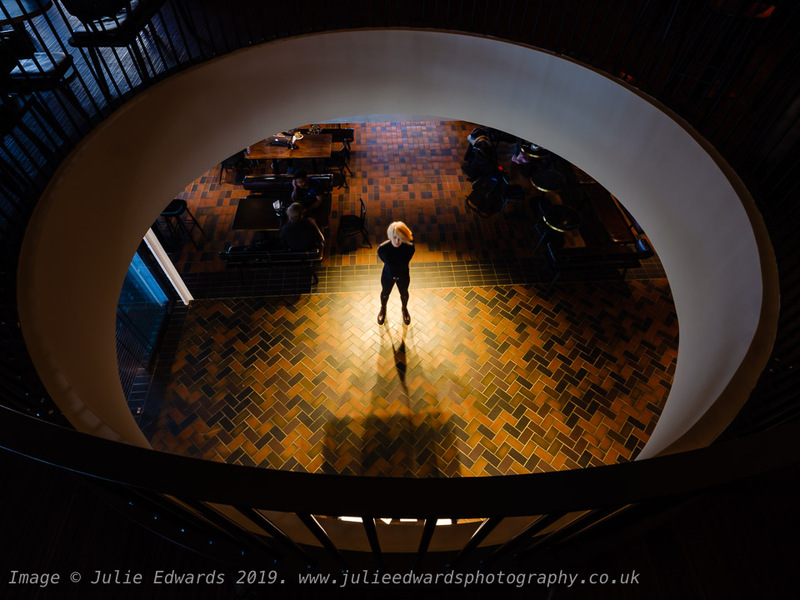 As well as photographing the obvious, I am always looking out for the less obvious, the images that might capture the atmosphere of the event. The image above was shot at 10000iso, 1/100th and F2.8, and as you can see, with a little bit of an edit on the RAW file, its fine for social media and press use. Nadine Labaki on stage at Mark Kermode Live in 3D on Monday 28 January 2019 at BFI Southbank, London. Nadine joined Mark onstage to discuss her film Capernaum. Picture by Julie Edwards. I tend to have the focus set to “s”, sometimes with Face Recognition, sometimes without. Using it makes images like the above a whole lot easier to capture. 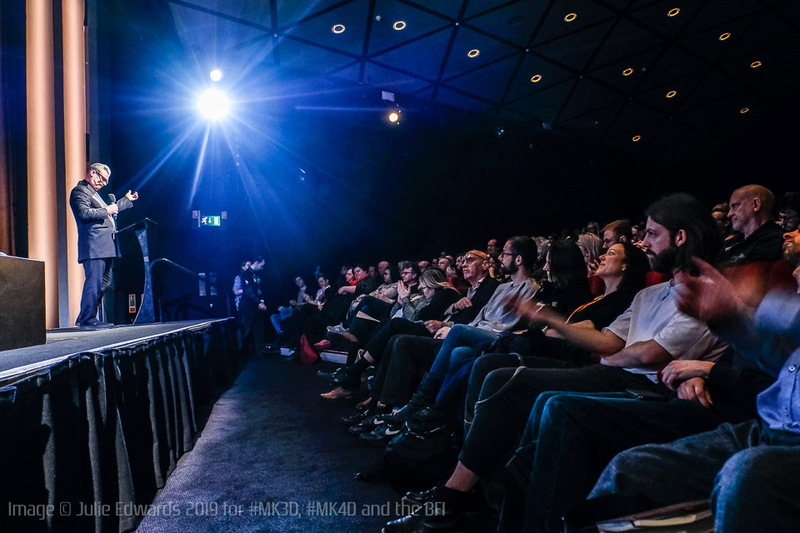 Mark Kermode on stage at Mark Kermode Live in 3D on Monday 28 January 2019 at BFI Southbank, London. . Picture by Julie Edwards. Within minutes of the show ending, the images are on my laptop, loaded into lightroom and I start posting to social media (facebook, twitter and instagram) to publicise the event (with fully researched hashtags and handles where appropriate). At the same time, appropriate images are syndicated to press. 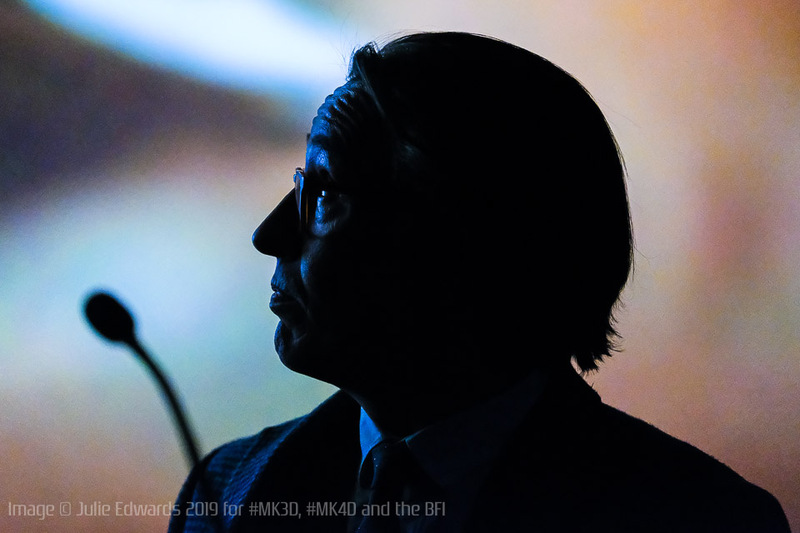 Working this way I am able to help build the reputation and visibility of any event I am employed to cover…..
Steve Coogan on stage at Mark Kermode Live in 3D on Monday 28 January 2019 at BFI Southbank, London. Steve joined Mark to chat about his film Stan and Ollie. Picture by Julie Edwards.